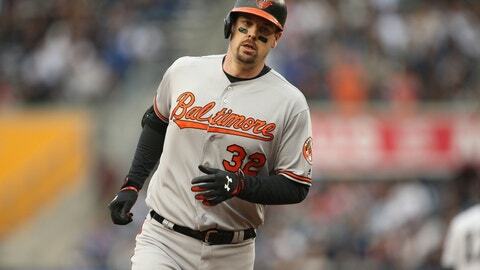 The Tampa Bay Rays have reportedly made a one-year offer to catcher Matt Wieters, and a union between the two might make sense for both sides. The Tampa Bay Rays simply aren’t going to attract much spotlight, but the little-club-that-could has made a series of interesting moves this offseason in a bid to put a solid team together. With Spring Training finally here, could they have one more surprise for us? According to Marc Topkin of the Tampa Bay Times, the Rays have made an offer to free agent catcher Matt Wieters. Topkin is quick to point out that the proposed deal is “likely for one year and certainly for millions of dollars less than what Wieters and agent Scott Boras are seeking.” Given the Rays’ financial constraints and the general way they operate, that’s not unexpected. However, with the 2017 season right around the corner, is the still-unsigned Wieters really in a position to get too picky? The former Orioles backstop obviously envisioned a robust, multi-year contract for himself at the start of the offseason. It never materialized, and looking around the league, it’s hard to pinpoint a team that is likely to give Wieters anything more than a one-year, “prove it” sort of arrangement. Tampa Bay might actually be as good a place as any for him to get himself back on track and rebuild some value. The Rays already added Wilson Ramos earlier in the offseason, and though the former Nationals catcher is optimistic about his return from ACL surgery, he’s still expected to miss significant time. Bringing in Wieters would allow Tampa to bring Ramos along slowly while providing an upgrade over their current catcher mix, which includes Curt Casali and Luke Maile. As Topkin illustrates, the Rays have an enticing young pitching staff for Wieters to work with, additional at-bats likely available in the DH spot, AL East familiarity, as well as close proximity to his home in the Atlanta area. The 30-year-old could certainly do a lot worse for a potential one-season stopover. Wieters’ disappointing free agency experience largely stems from the underwhelming year he had at the plate in 2016. Though he showed some signs of his earlier power, swatting 17 homers and driving in 66 runs, Wieters posted a mediocre .243/.302/.409 slash line for the season. His .711 OPS was his lowest since 2010, and his 87 OPS+ was the worst mark of his career. In terms of defense, Wieters rates as a poor pitch-framer, and with his advancing age and injury history there is presumably some concern about how his skills will hold up over the next few years. If there was a bright side to Wieters’ 2016 season, it was that he managed to play in a respectable 124 games after appearing in a total of only 101 over the previous two years as he underwent Tommy John surgery. On a cheap, one-year deal, teams would likely be willing to overlook those shortcomings on the chance that Wieters might recapture some of his past glory. Another year removed from surgery, perhaps he’s destined to fare better in 2017. That’s surely what the team that eventually signs Wieters will be telling itself. The Rays might not be alone in their interest, late as it may be. Jayson Stark of ESPN recently reported that the Nationals are remaining in touch, though they too are hesitant to offer more than one year. A franchise like the Rays needs to take calculated risks, and Matt Wieters might fit the bill. If he enjoys a rebound performance, he could end up being one of the offseason’s most unexpected bargains.